We were super excited when MrJ got accepted onto his Mandarin programme at Sichuan University and realised we were moving to Chengdu. 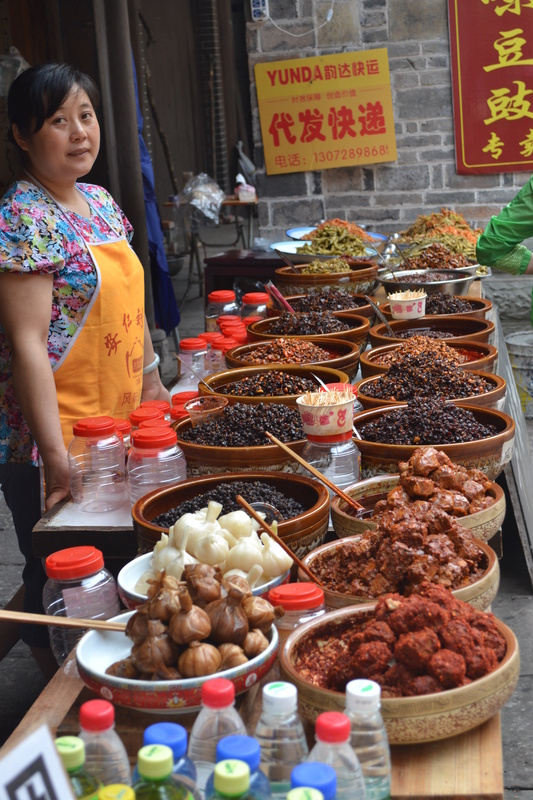 However, I was also a little apprehensive as Chengdu is pretty-much the spice capital of China. I have such a low tolerance for spice and thought this was going to be really difficult for me. However, I found the sichuan pepper spice, when used properly, was not over-powering and had a gorgeous floral smell and taste. 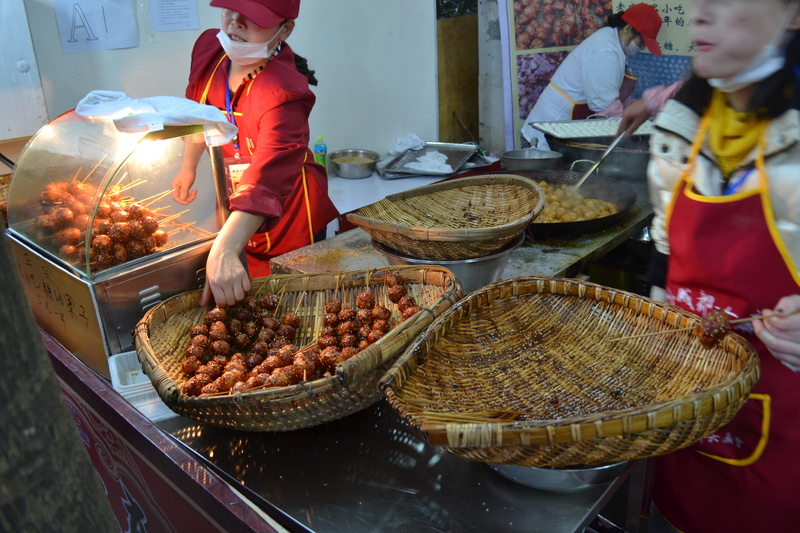 I would regularly add it to my dishes and think the taste is the essence of Chengdu eating. 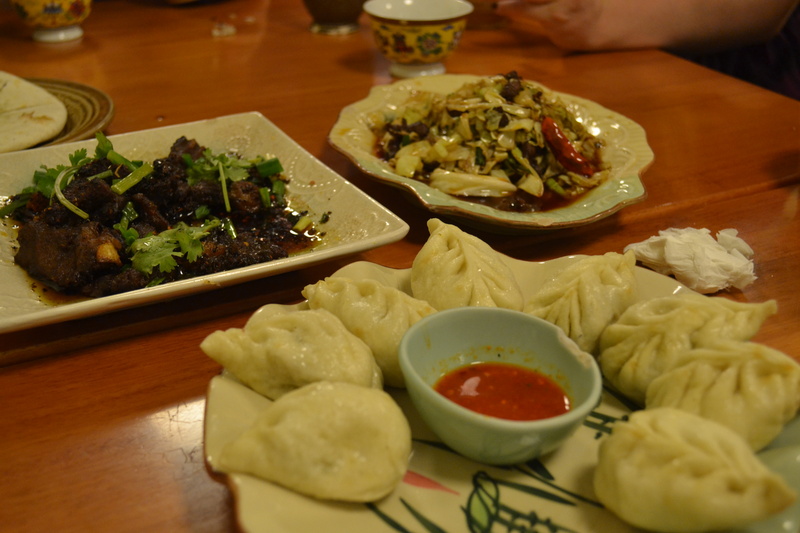 So, here are our recommendations for what to eat when in Chengdu! 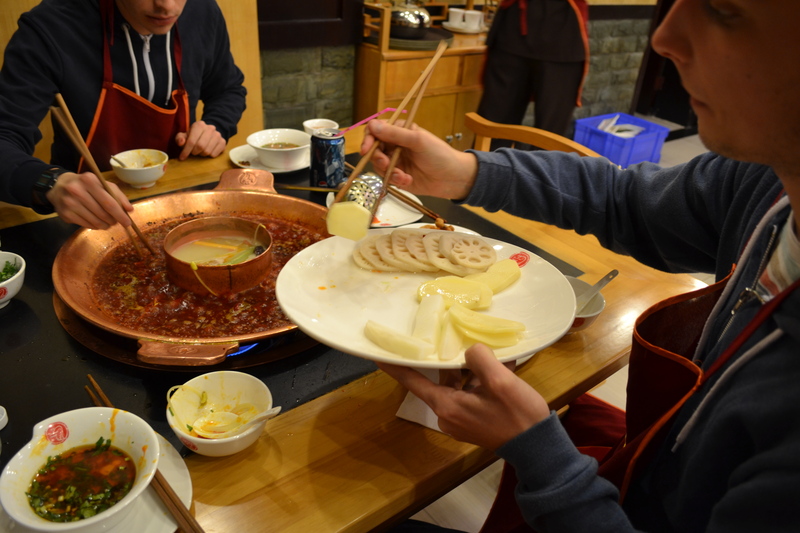 You have to have Hot Pot if you go to Chengdu. If you don’t, it’s like going to the beach and not getting fish and chips; in other words, just plain wrong. 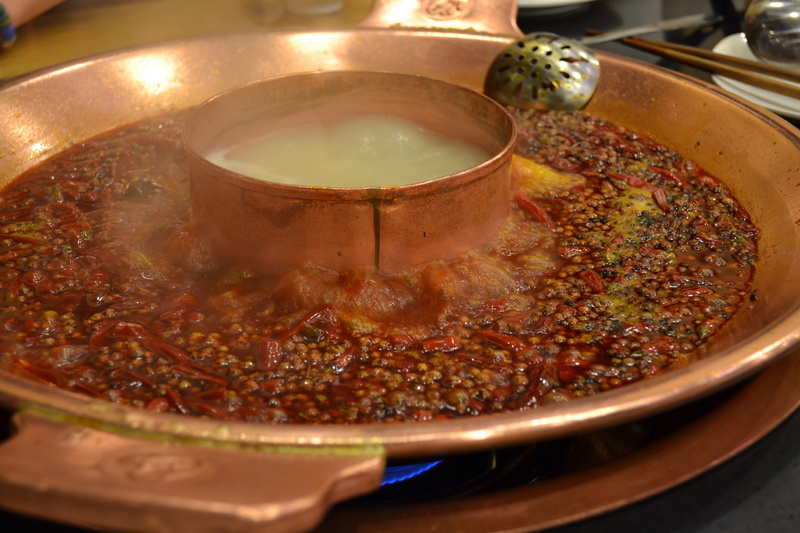 If you aren’t brave enough to get the full sichuan-spicy version, you can go for a ying-yang version which has a broth as well as the spicyness. You can add whatever you want to the Hot Pot. I recommend a mixture of meat and vegetables. Watery vegetables like cabbage and lettuce don’t work too well as they just soak up the oily mixture and practically dissolve. Sweet potato, lotus root and straw mushrooms work well. We once had cow’s tongue (translation error on my behalf!) but it still tasted good! 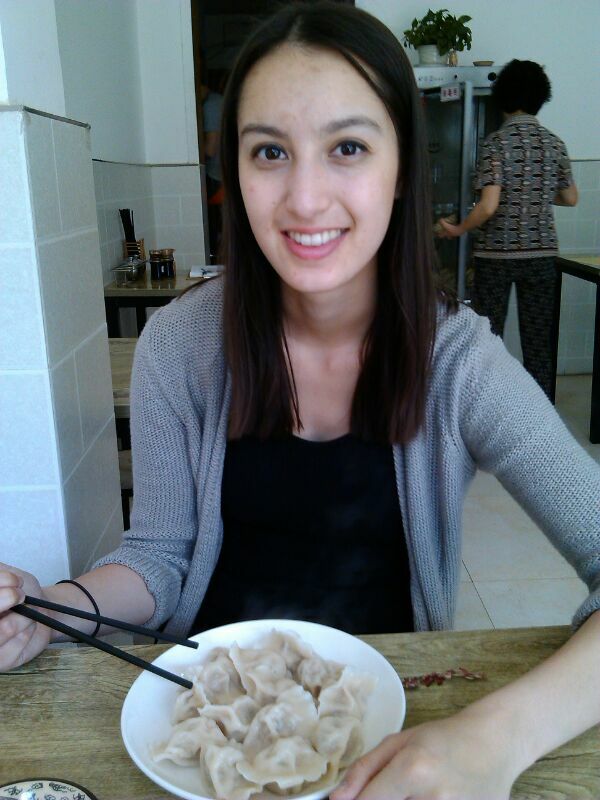 Oh, I love dumplings so much. 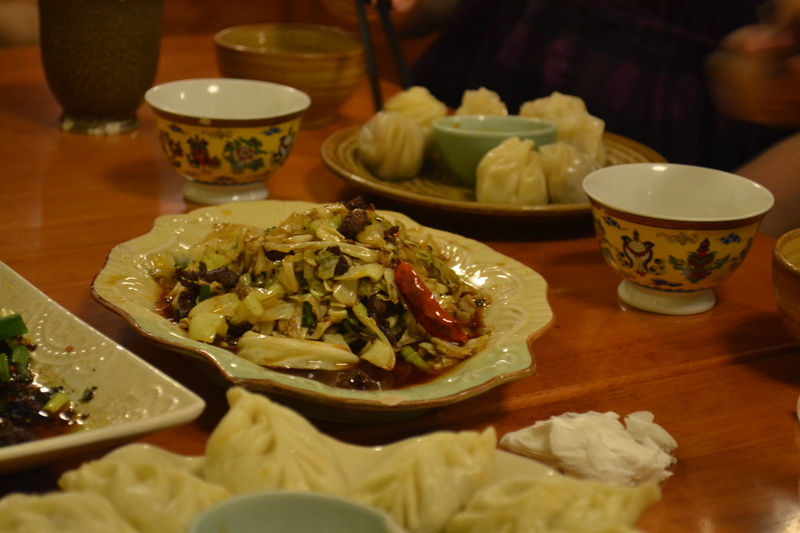 You can get boiled dumplings (jiaozi) , dumplings in soup (chao shou) and the big fat bready dumplings filled with meat or vegetables (baozi) that they usually eat for breakfast. These are boiled dumplings. You buy them according to an old Chinese measurement of weight called liang. 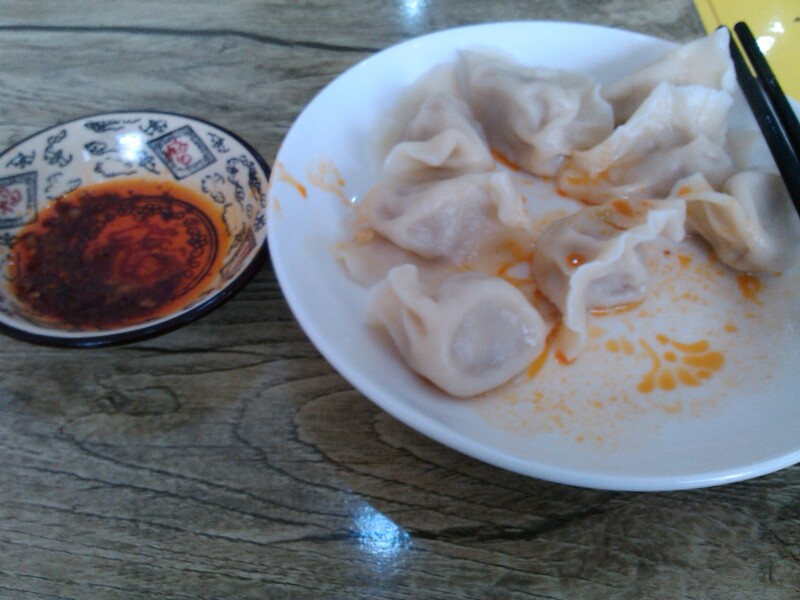 1 liang = about 7 or 8 dumplings, so I’d usually get 2 liang! My favourite fillings were pork and tomato and pork and coriander. You have a bunch of condiments on your table that you use to create a concoction to dip your dumplings into. I recommend a good few spoonfuls of the gritty chilli oil, a spoonful of garlic, a spoonful of sugar and a swig of vinegar; all mixed together! Soup dumplings are also delicious. 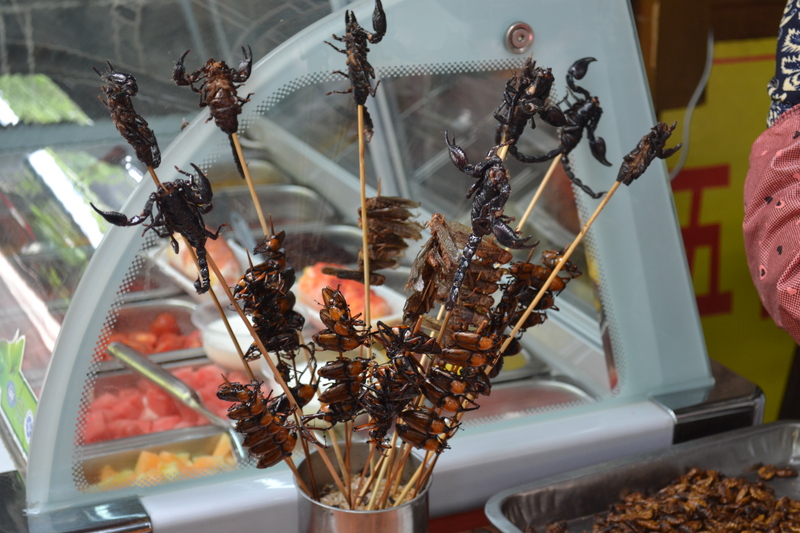 They come in a broth and you eat them with chopsticks and a spoon. We found a really good soup dumpling place just before we left, so we didn’t get a change to try all their varieties, but a simple vegetable broth with pork dumplings was soooooo good. 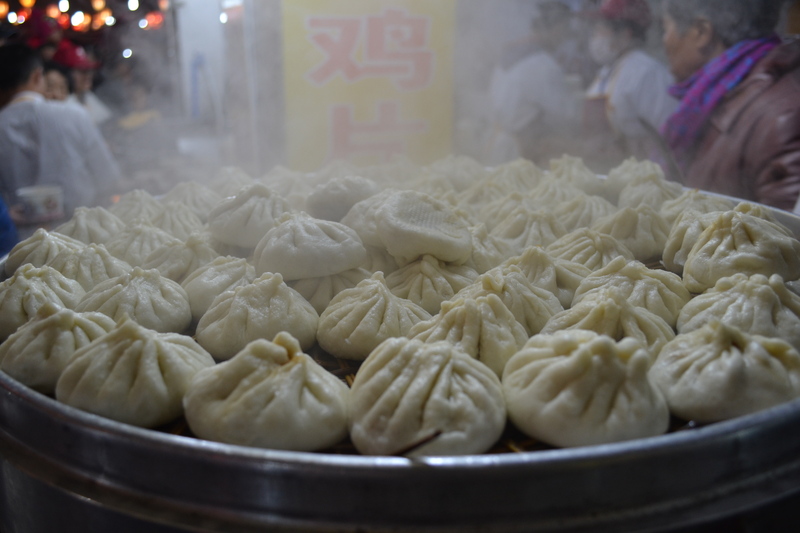 Bready dumplings (baozi) are usually eaten for breakfast, but I would try and eat them whenever I could get my hands on them! I used to love eating breakfast at my school’s canteen. 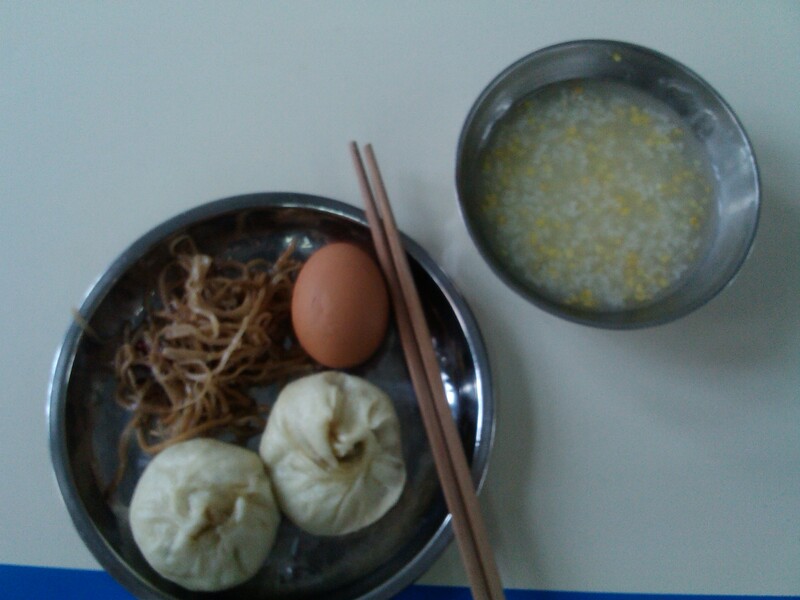 I would get 2 big dumplings (baozi), a handful of pickled vegetables, a boiled egg and a bowl of rice porridge for 20p! Chengdu is the last big city in the west of China before you hit Tibet so it’s got quite a large Tibetan population who have their own Tibetan district just down the street from where we lived. 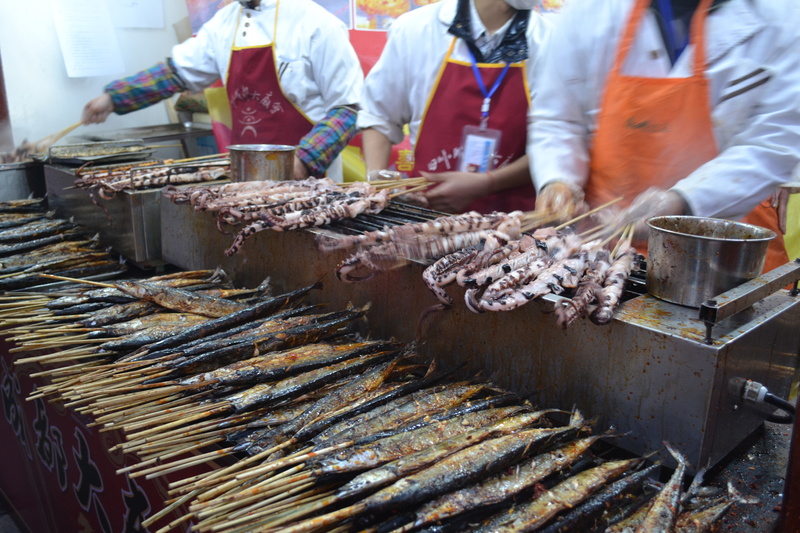 It’s so cool how different the culture and even the food is compared to the rest of Mainland China. The speciality in Tibetan food: Yak, and lots of it! 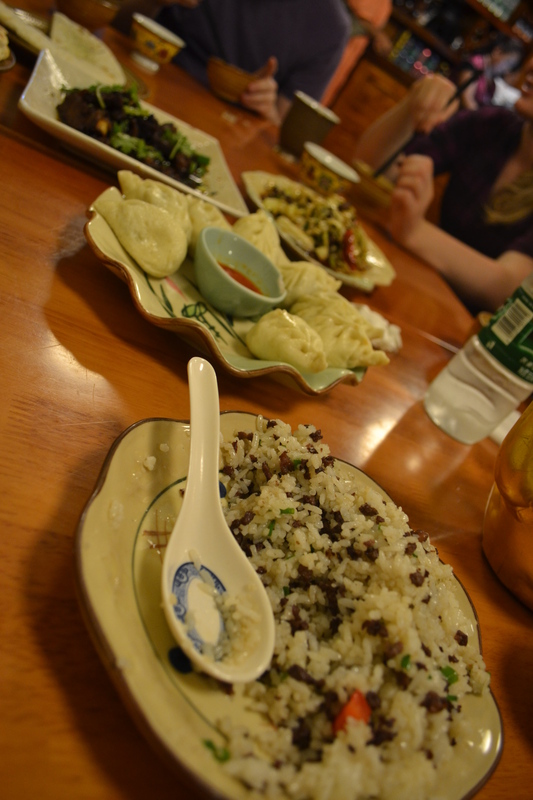 We went to a lovely Tibetan restaurant and had Yak fried rice, Yak dumplings, Flat bread with Yak butter (it tasted quite cheesey), as well as BBQ’d yak! I find Tibetan food is a safe bet if you aren’t adventurous with Chinese food as it’s not spicy and yak doesn’t really taste that much different from beef! They also have lots of bread, potatoes and simple vegetables. I love noodles. But not just from any place. I love noodles from the Muslim ‘Halal’ Noodle places. 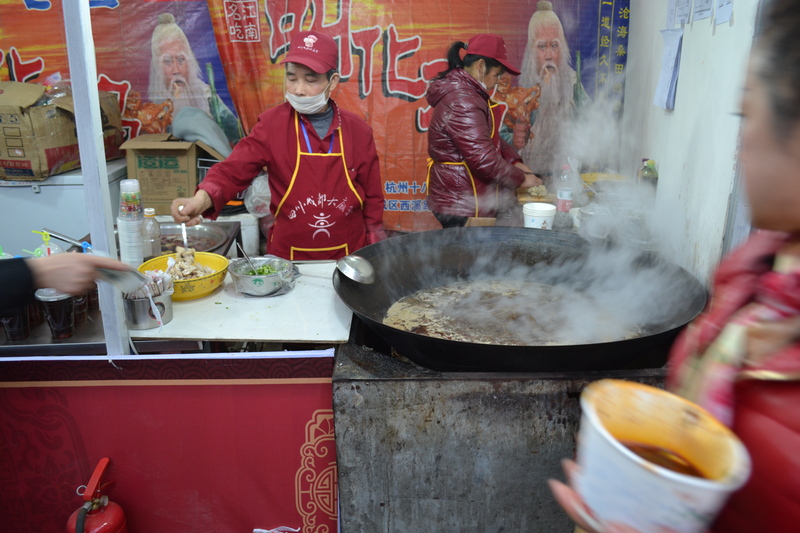 They would make the noodles in front of you; rolling, throwing and twisting dough in the air until somehow the dough transformed into noodles. They would then toss them into a pot of boiling water to cook. You could ask for thick flat noodles, shaved noodles, thin long noodles, they could do them all. My favourite dish was lamian; thin long noodles in a beefy broth with thin slices of beef and lots of chopped coriander. I also loved the thick noodles stir-fried with scrambled egg, tomatoes and bok choy. My goodness, they were delicious. I wish I had a picture of them, but I was always too busy gobbling and slurping to remember to take a picture! I’ll just have to live with the memories! Family style food is what I think western people typically think of when they think of Chinese food. 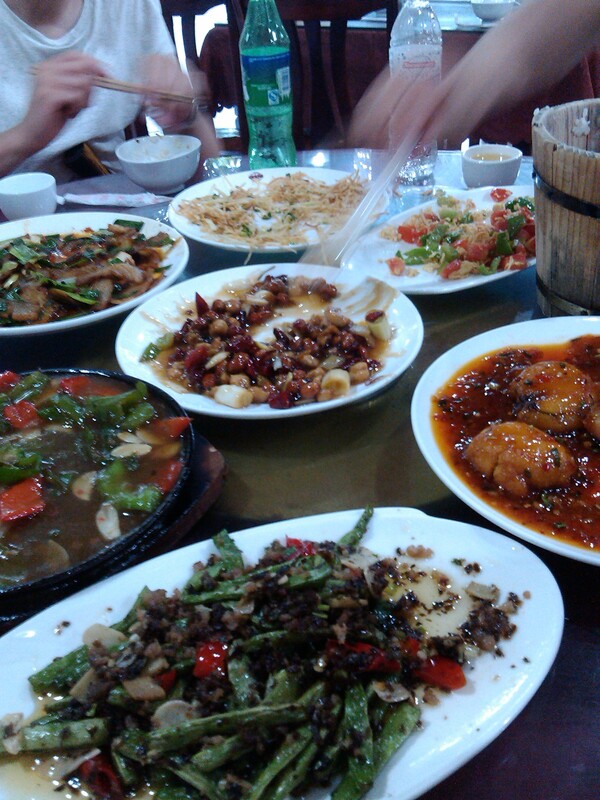 It’s stir-fried meat and vegetable dishes with lots of rice. It’s a really sociable way of dining and some of my favourite meals were spent in family style restaurants. Now we’re getting into the good stuff! 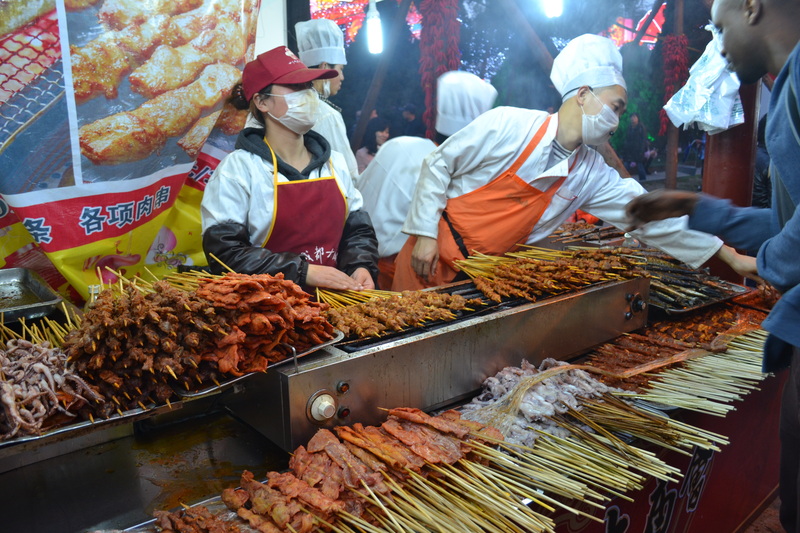 Street food is abundant in Chengdu. It’s cheap, it’s fast and it’s so hard to make a choice on what to buy! 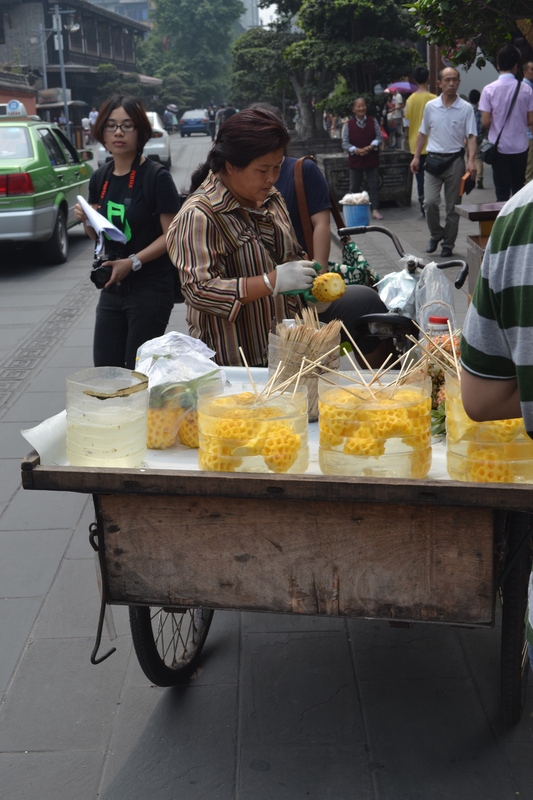 You have fruit being sold on little carts on the back of bikes, changing with the seasons. I loved the fresh pineapples, watermelon, peaches and grapes. 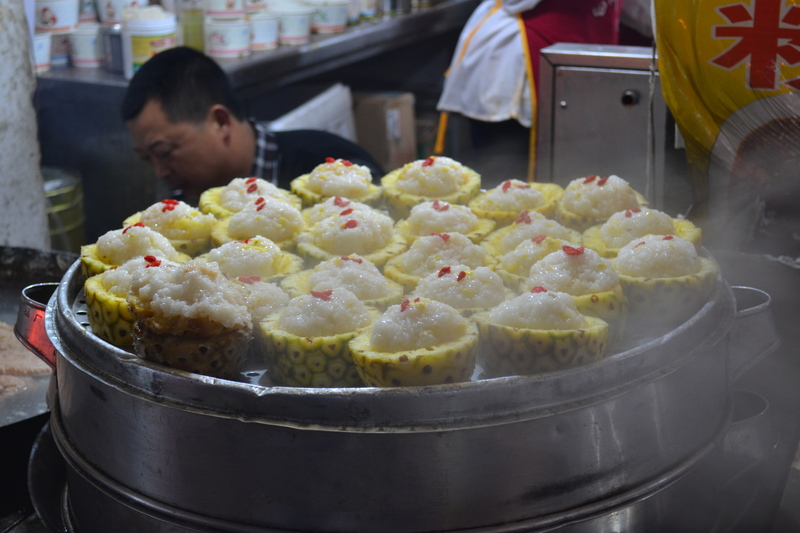 I loved the pineapple rice that is served inside a hollowed out pineapple and is cooked in the pineapple juices. 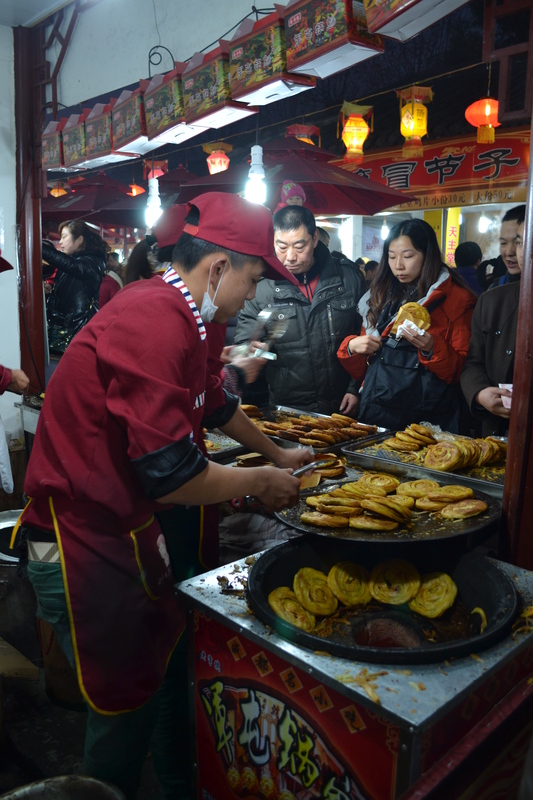 I loved the crispy, oily flatbreads that they fry on a huge wok filled with oil. I loved the weird and the wonderful, although I wasn’t always brave enough to try. So if you ever venture to Chengdu, please let us know! We’d be happy to give you recommendations, write down names of dishes for you in chinese characters for you to take along, and we definitely would want to know what you thought of the place and what you ate! We loved that we were able to live there for a year and experience a completely different culture and diet! It was incredible! Hi, do you have the address of that dumpling place? As I’m looking for non spicy jiaozi and baozi in Chengdu. Thanks! 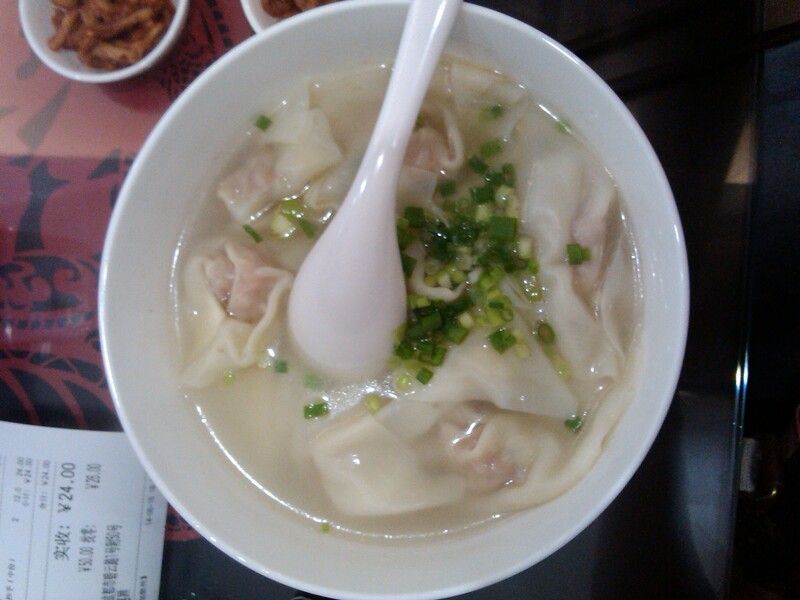 Hi Mike, this dumpling place was at the intersection of GaoShengQiao Road and GuangFuQiao North Road in Wuhou District. However you will find dumpling places like this pretty much on every street in Chengdu and you can choose whether to make your dumplings spicy or not by the condiments! We hope you love Chengdu as much as we did.